Rep. Maxine Waters at a recent press conference in support of reining in predatory payday lenders. Representative Maxine Waters (D-CA), Ranking Member on the House Financial Services Committee, recently released a report exposing five tactics used by payday lenders to evade state consumer laws. Titled “Skirting The Law: Five Tactics Payday Lenders Use To Evade State Consumer Protection Laws,” the report highlights underscores the need for strong federal protections. Ohio: Had previously enacted the strongest anti-payday abuse laws by establishing interest rate caps, payday lenders swiftly disguised operations as cash advances under the mortgage lending statute and kept doing business as usual. Texas: Payday lenders falsely registered as Credit Access Businesses, circumnavigating state laws by staging as a work field untouched by the limits placed on payday lending. Furthermore, these ill-boding “credit access” institutions are able to collect additional fees and interest referrals from affiliated businesses. California: Lenders avoid state business licenses altogether by preying on consumers online. Florida: Lenders’ ability to issue multiple loans in a single day helps them take advantage of the state’s 24 hour cooling-off period. Colorado: Evasion tactic for payday lending operates through the establishment of partnerships with Native American tribes in order to use their sovereignty to avoid state restrictions. The report reminds us that payday lenders will exploit any loophole they can find in order to continue their debt trap lending by any means possible. They will slither through every crack in every law. 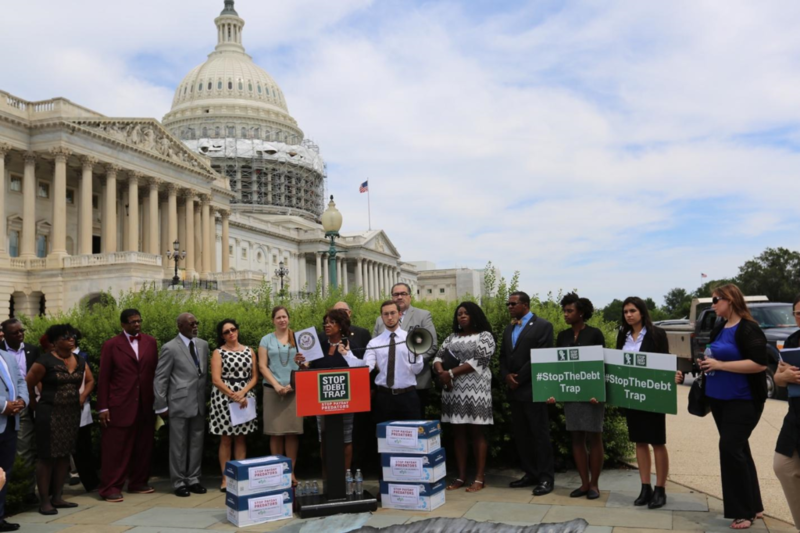 Upon the release of this report, the Congresswoman welcomed consumer advocates and faith-based leaders, almost 50 people in all, to join her in a discussion on the abuses in the payday lending industry, how they affect the most vulnerable populations and why strong federal rules, with no loopholes, are needed. Payday lenders have a history of exploiting even the tiniest weaknesses in state law. The 5 examples in this report are a reminder of the lessons we’ve learned over the years about the shape shifting nature of this predatory industry. If these CFPB heeds these lessons, and closes the potential loopholes in its proposed rules, this rule has the ability to free millions of Americans of the harmful payday debt trap.